SVN Rock Advisors Inc., Brokerage is the pioneer in bringing institutional services to the mid-market (6 to 80 units) and elevated services to institutional brokerage of (120 to 1000 units) apartment buildings. We have over 25 years of experience servicing the mid-market, brokering, consulting, advising, and creating feasibility studies. If you are the owner and want to sell or buy, you are important to us, and we want to hear from you. We have divided the apartment mid-market into a number of territories, each serviced by well-trained professionals including a team of brokers, virtual assistants, researchers, etc..
industry. 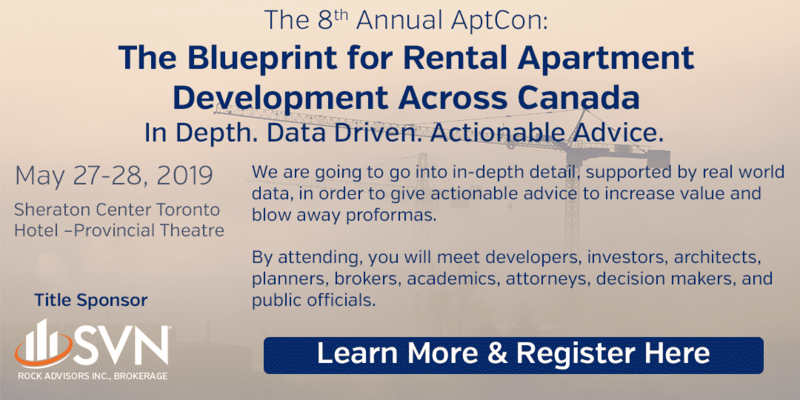 As a result, more of the apartment stock within the province is coming under the ownership of portfolios held by institutions, pension funds, private equity investors and REITs. Indeed, a total of nine REITs – Timbercreek, Boardwalk, Killam, Skyline, CAPREIT, Interrent, Mainstreet, Centurian and Transglobe – have amassed large regional and national portfolios. Brands such as Homestead, Vertica, Morguard and Minto are now prominent. Apartments have become a safe asset class, and investors are stepping forward to reap the returns. In the past decade, one market limiting factor was low-interest rates. While these favoured investors buying apartment stock, it was a considerable incentive for renters to defect to home ownership. While interest rates remain low, however, there are signs that the frenzy of home buying has abated. Not only has the heated housing market made renting more attractive, demographic changes favouring smaller families and people’s growing weariness of long commutes have sparked an interest in high rise living in urban centres over home ownership in the sprawling suburbs. A condominium boom is already underway in Ottawa, Toronto and Waterloo Region, but as housing prices continue to increase, more people are turning to rental units to save money up front and to live in places close to work, school and other amenities, that simply weren’t possible or affordable under home ownership. brokerage, lending and consulting practices. Confidence is growing in the industry after the past five years when the performance of purpose-built rental apartment stock remained stable and consistent, especially when compared with other investment sectors. Investors have found that owning an apartment building remains a significantly less risky investment. Not only is the risk spread out among many tenants, but low-rate insured financing from the Canadian Mortgage and Housing Corporation have allowed building owners to refinance their debt at favourable rates. Buildings have been recapitalized, with landlord operations modernised and streamlined, making them increasingly attractive to REITS and corporate and institutional investors. INTERESTED IN NEW APARTMENT CONSTRUCTION IN THIS REGION? A poor deal in Markham isn’t better than a great deal in Niagara Falls.